While most peasants in Europe were levied into the army, at sword point if need be, some welcomed the opportunity to earn some pay, and travel. 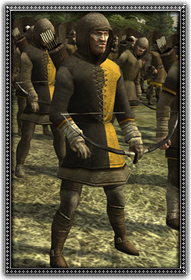 Their bows are designed for hunting rather than war, so are only effective against lightly armoured foes. They carry a knife for protection, but should be kept out of hand to hand combat, and will probably run away if any seems likely.